We work closely with our clients selecting promotional products to enhance their strategic marketing and recognition programs. 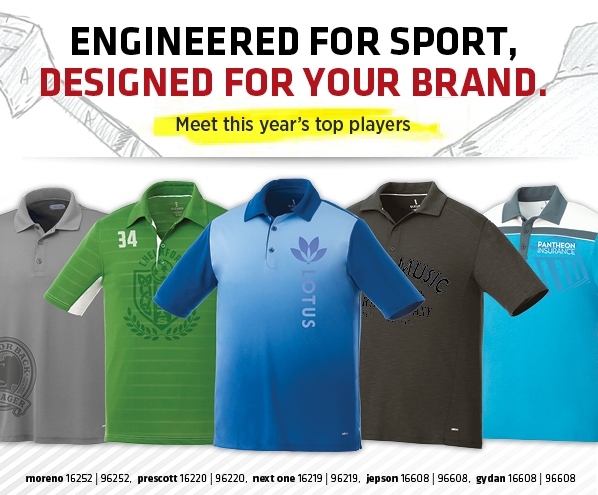 Designed to be decorated for your brand, these polos are constructed of both 100% micro-polyester interlock knit and cotton blends with moisture-wicking finishes for maximum comfort. Trendy designs and sleek colour blocking truly set these pieces apart, while being fully functional: breathable, comfortable and versatile, with snag resistant and UV protection fabric technology. Available in a large array of colours and sizes. Ladies compatibles and youth sizes also available (for some models). Showcase your brand to it’s fullest potential with the various decorating techniques available. Together we can create a truly unique and distinctive garment! We offer a variety of high-quality imprinting methods (Embroidery, Transfer, Deboss, Laser, Screenprint, Patch) to extend your brand onto fashionable apparel. Each has its own unique look so you can select the one that best showcases your brand. Our expertise in decorating allows you to have fun with your logo by combining multiple methods and multiple locations on the same garment – for maximum creativity and brand exposure. Wristbands have elevated to a new level with the addition of Bugban! These Bugban mosquito-repelling wristbands are the perfect promotional products for company picnics and any other outdoor outings; after the get-together, your wristbands will still be useful. Watch your company’s logo spread around town, while mosquitoes don’t!